He was the first Chief Minister of Bihar. He was a lover of books, a valiant freedom fighter who left his lucrative legal practice and spent nine youthful years in Jail. He became prime/chief minister of Bihar in 1937, 1946, 1952 and 1957 and continued on the position till his death in 1961. He is best remembered for his contribution in the field of education and industries. Barauni Refinery, HEC, Bokaro Steel Plant and Engineering Colleges like BIT Sindri, RIT Jamshedpur, Agriculture College at Pusa and Ranchi were opened by his effort and initiative. During his period Bihar was the best administered state of India. In the year 1947 Late Dr. Srikrishna Sinha the then premier of Bihar, completed 60 years of age. Pt. Binodanand Jha, the then Minister for Local-self Government took initiative and formed a committee at state level to celebrate the diamond Jubilee of Srikrishna Shina. The news soon spread to other important towns of Bihar and as a result, a Celebration committee was formed at Muzaffarpur with Late Shri Mahesh Prasad Sinha as chairman and Late Babu Braj Behari Prasad and Shri L. P. Shahi as secretary. People contributed generously to the committee. Many eminent personalities and the philanthropic persons donated large sums of money. This purse was utilized by the committee in opening up of R. D. S. College. Till then Bihar has only one law college at Patna and Shri L.P. Shahi conceived the idea of opening a Law college at Muzaffarpur and with the help of Shri Mashesh Prasad Sinha had been able to implement the scheme of holding the classes in the hall of B. B. Collegiate school where a temporary structure was raised later on fornthis college. A committee was formed with Shri Mahesh Prasad Sinha as president and Shri L. P. Shahi as the secretary of the proposed college. Some senior advocates like Shri Kishore Narayan, Shri Ram Naumi Prasad, Shri Basudeva Sahay Verma, Shri Jaimangal Sharma, Shri Tripurari Sharan Sahay and Shri Triveni Prasad Singh, (all now deceased) agreed to teach honorarily for the first two years. After completing the formalities for starting a college, the committee received an Inspection Team from Patna University which made an affirmative recommendation. By July 1948, Srikrishna Jubile Law college was under way and got temporary affiliation. In 1951, college got permanent affiliation up to B. L. (Honours) standard by Govt. of Bihar under the then Patna University. Babu Kishore Narayan a senior advocate and Ex-chairman of Muzaffarpur District Board became first principal of the college. By 1965, the college has acquired 6.20 acres of land in Gannipur. Thereafter the construction of a two storied building was started. The college shifted to the present building in 1969 and the temporary structure, still in existence was given to B.B. Collegiate school. Besides various lecture halls tutorial rooms and an administrative block with a separate library. It has a very good infrastructure. It has student reading hall, store rooms, journal section, teachers reading rooms etc. This library was inaugurated by Hon’ble Chief Minister of Chattisgarh Shri Ajit Jogi. There is a big playground too. This college has a big Auditorium which was inaugurated by Hon’ble Governor Chattisgarh His Excellency Shri Dinesh Nandan Sahay. It has been named as “Hemant Shahi Sabhagar”. This Auditorium is one its kind having capacity of about 1000 persons. The college has constructed a beautiful well furnished Guest house. It has many rooms for the guests to stay. The college has about 65 teaching and non teaching staff. The college is dependent on its own internal resources and occasional U.G.C. grants. All money transactions are through the bank. Students fee are deposited through bank challan and employees are also paid through bank. 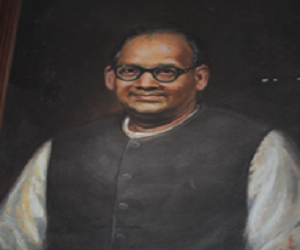 After the death of Shri Mahesh Prasad Sinha in August 1971, Shri L. P. Shahi was elected as the president. He continues as such even today. Shri Ramdeo Sharma M. L. A. was elected as Secretary. He was succeeded by Shri Suresh Kumar Sharma in 1991 who continued for two terms. After his retirement Dr. Nageshwar Sharma was elected as Secretary. He was a retired principal of R. D. S. College, Muzaffarpur and a professor in physics. He had vast academic experience for about forty years and the college celebrated its golden jubilee under his guidance. After completion of six years Dr. (Smt.) Ujjwala Mishra was elected as Secretary in 2004. She is from teaching profession and is a upcoming person with a promise. During her regime this college has sponsored opening a institute of technology at Muzaffarpur, Bihar which preparation is being made. “As one lamp lights another nor grows less nobleness enkindeth nobleness” An institute of technology is a long felt need of North Bihar and S. K. J. Law College Authorities have shown how a well run institution can sponsor another. So far infrastructure is concerned during last three years it has built six lecturer quarters and a new academic block with sufficient space. U. G. C. has been good enough to sanction a girls hostel of 50 seats which is completed and running.